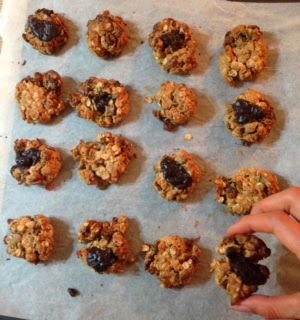 Orchard Fresh Nutrition : Cranberry, Seed and Dark Chocolate Cookies. It's been a really long time since I've posted a blog. Like a really long time. I'm sorry. A lot has happened between posts; I've attended a paediatric feeding conference, a health coaching course, a non-dieting seminar (yes, you read right, a seminar on how to NOT diet! ), a holiday to Bali, and a concert. Of course there have also been innumerable sessions in the gym, walks in both the sunshine and rain, afternoons in the garden and evenings in the kitchen. A most noteworthy evening in the kitchen recently sought to produce some baked goods for a meeting at work the following day. Everyone expects a dietitian to bring something delicious to liven up a work meeting. I didn't really know what I wanted to make - I just wanted it to be ready rather quickly, consist entirely of ingredients already in my possession, be nutritious, and of course, taste delicious. And so these cranberry, seed and dark chocolate cookies came into fruition. Cooking time: about 15 minutes (17 minutes in my oven to be exact; individual ovens may vary). 1. Pre heat oven to 180C (170 C for fan forced). Line 2 baking trays with baking paper. 2. Sift flour into a mixing bowl. Mix in the oats, sugar, seeds, sultanas, cranberries, cinnamon and vanilla and stir until combined. 3. Add the tahini, coconut oil, honey and egg and stir well. 4. Take teaspoon-fuls of the mixture and roll into balls. Place onto trays roughly 3cm apart to allow for spreading. 5. Using the back of a fork, slightly flatten the balls. Top with small pieces of the dark chocolate. 6. Bake for about 15 minutes, or until biscuits are golden and dark chocolate is melted. Enjoy!! Notes - you could also add dark chocolate into the biscuit mixture rather than only on top - I think this would be very delicious! You can also vary the fruit included in this recipe; dried goji berries, blueberries, figs, dates and apricots would surely be just as tasty. And finally, you could also vary the seeds or add some nuts; I imagine chopped pecans, walnuts, or macadamias would be a scrumptious addition here. Cranberry, seed and dark chocolate cookies warm and fresh from the oven.... I couldn't resist! !